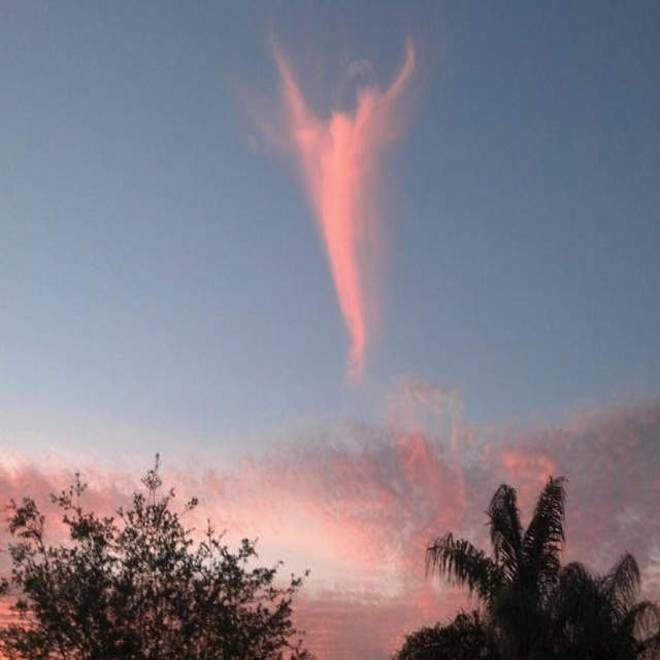 WPTV's viewers in South Florida sent in numerous pictures of Wednesday's "cloud angel." A "cloud angel" rose over South Florida on the day that a new pope was named at the Vatican — resulting in snapshots and comments that multiplied like the biblical loaves and fishes. But experts say Wednesday evening's apparition is no supernatural miracle. Rather, it's a perfectly natural phenomenon that took on special meaning because of Pope Francis' selection. Several pictures came in to WPTV in West Palm Beach. Some saw a slim, winged figure in the cloud. "Wow, I wonder if Pope Francis ordered that!" one commenter, Thom George, said on WPTV's Facebook page. Others saw different shapes — a sea monkey, perhaps, or even Lucifer's satanic figure in the sunset. Ian Loxley, photo gallery editor for the Cloud Appreciation Society, saw a cloud. A very interesting cloud. "It is difficult to be definitive about what the formation is without knowing what went before. It could be Cirrus if high enough; however, it appears to be lower than the background Altocumulus which is the teaser. My best shot would be a virga remnant from an aircraft contrail," Loxley said in an email. "Sorry not to be able to give an absolute answer," he continued. "It is, however, a very interesting capture that would sit nicely in our 'Clouds That Look Like Things' section of the gallery." The society's cloud galleries show off all sorts of shapely formations, including doves, dolphins, UFOs, witches and, yes, angels. Fewer things are better-suited than clouds for this kind of pattern recognition, which goes by the name of pareidolia. Our brains are so wired up to recognize faces and other humanlike patterns that we can easily see them in inanimate objects. "Pareidolia" is a combination of Greek words that essentially means "wrong shape." It's the same phenomenon that gives rise to the Face on Mars, or Mickey Mouse on Mercury, or New Hampshire's now-noseless "Old Man of the Mountain." In the case of the cloud angel, the religious connection was heightened by the coincidence of the papal conclave. Could the cloud angel be a hoax? That's not likely, given the fact that WPTV received pictures from several viewers in different locations. Also, there are much crazier cloud shapes out there. But if you want to look at Wednesday's coincidence as a sign from above ... well, that's a matter of faith, not atmospheric science.